Question 1. How do you think UU congregations can reach those who identify as “nones,” including nones who wouldn’t identify themselves as spiritual? One idea the UU Humanist Association has launched is a “Freethinker Friendly” designation, specifying that individual UU congregations welcome those who identify themselves outside of traditional religions. How would you imagine that working? What other ideas do you have that tie UUism’s humanist roots with the growing number of people who identify as secular in America? Unitarian Universalism is one of the religions with the greatest potential to capture the interest of people who identify as “nones” – both those who call themselves “spiritual but not religious” and those who call themselves “secular.” As a minister who serves a congregation with a strong Humanist heritage, these populations are one of the reasons we are growing in numbers. One of the important barriers to overcome is how to reach the population of “nones,” who may not even be looking for a congregation, or don’t think a congregation is the right place for them to find meaning, community, and hope. One way we reach the “nones” is by proactively engaging in the community that surrounds our congregations. We cannot just wait for them to walk through our doors, although, some of them will if we have language and messages on our website that include their points of view. In Morristown, we are deeply engaged in justice movements in Northern New Jersey – for immigrant justice, LGBT rights, black lives matter, ending mass incarceration, environmental justice, and economic justice. We partner with our interfaith neighbors and with secular justice organizations and non-profits. Many “nones” are longing for a community with whom to organize to make a difference in the world. People discover we exist at these events and learn through the language we use there that we include atheists, agnostics, and theists as part of our leadership and membership. We also support community building activities in the region in which we are located – town fairs, musical events, interfaith activities, volunteer opportunities, community organizing, walk-a-thons, etc. We are conscious to host and publicize classes and open them to the wider community that may attract Humanists – science and morality oriented presentations, political town halls, musical events, fine arts, finances, OWL, volunteer engagement opportunities, and several community support groups are hosted in our building. Many Humanists discover Unitarian Universalism by showing up in our building for something that interests them or at a community event that we have helped organize. The story of Morristown is a similar story I have heard in other growing congregations around the country. I can imagine integrating a “Freethinker Friendly” branding campaign into the publicity surrounding these events and initiatives. Another way we reach the “nones” is by experimenting with how we create Unitarian Universalist community outside of traditional congregations. 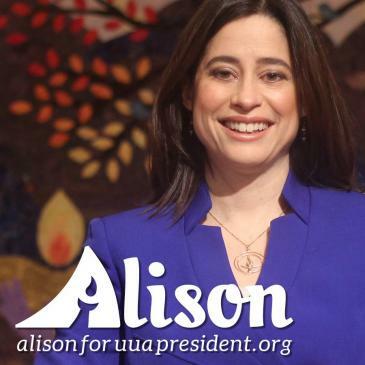 I am a candidate for UUA president who has 24 years of experience supporting ministries outside of congregations (and 27 years of experience inside congregations). I have been involved in tending, building, and fundraising for UUism online, on college campuses, in prisons, and in emerging spaces. All these places include Humanists, UUs, and UU Humanists who have a growing need for what our tradition offers, and I am ready to continue to support these creative, important efforts as president. We are living in a time of division, dehumanization, and devastation in our country and around the globe. Our Humanist roots bring us closest to the wisdom that human beings must take responsibility for the work of repair and reconciliation in our relationships to one another, all beings, and our planet. Humanist philosophers, UU and non-UU, offer us a framework of meaning-making that helps us to locate ourselves within today’s struggles and are a source of hope for moving forward together. We need the human qualities and abilities connected to curiosity, humility, compassion, creativity, intellect, cooperation, and diversity. When we lift up Humanism as an important source for our tradition, we have the capacity to live more deeply into our claim of being spiritually alive and inclusive. Question 2. How can Unitarian Universalists help to resolve conflicts between science and religious faith that are present in our culture and still present challenges to healing our world? Unitarian Universalism is a tradition that has rejected the notion of the sacred-secular split. We would include every source of wisdom to understand what it means to be alive and to live a life full of meaning and purpose. As a lifelong UU, I have always appreciated how the sciences are interwoven into our religious education, our worship, and our justice work. The sciences are very much a part of how we understand our placement as human beings in the interdependent web of life. They are also a critical component of how we can learn to combat the climate crisis, ecological crisis, and environmental crisis we are experiencing today. Science and Religion must co-exist together and inform one another as sources of wisdom and truth. In our religion, we do not believe that all truth was summed up in an ancient text, but rather we are continuously learning and testing new truths. Once again, there are many who chose to leave other faiths because of the dissonance they found between “the teachings of the church” and “the teachings of science.” Unitarian Universalism is a place where you can bring your whole self, including your body, mind, conscience, and spirit – and make-meaning through a framework that is open to integrating the truths that come from different domains – the arts, the sciences, human experience, sacred texts, etc. It is also a place where we can learn and grow in our ability to discern where to look for which truths. The biblical story of creation teaches us the metaphorical role we have as people who are called to be stewards of our Earth. Climate scientists teach us what we need to know about how to reduce carbon in the atmosphere to address global warming. Unitarian Universalism and UU Humanists play an important role in sharing the news: Religion and Science can coexist well together. This is a vital message to include in interfaith gatherings and in justice movements. Ours is a religion that does not put science and human experience in a secondary place, but rather incorporates them as primary sources of truth for leading a moral life. As a community leader, I work to be sure that the Humanist voice is represented just as I work to ensure the Muslim voice is represented. As a minister who is married to a science teacher who is also a lifelong UU, this is deeply woven into our religious life as a family. Question 3. In your own ministries, how have you responded to non-theists for whom religious language is a challenge, or who aren’t sure where they fit in Unitarian Universalism? What has worked well? This question is deeply connected to the ministry I have engaged with in Morristown over the last twelve years. For a longtime, Morristown Unitarian Fellowship’s religious identity was as a Humanist congregation. When I was called, one of the objectives of the leadership was to move towards a vibrant religious pluralism while also maintaining our role as a community that serves the meaning-making needs and aspirations of Humanists, agnostics, and atheists. Unitarian Universalism is a religious tradition that is non-creedal and covenantal in nature. We make room for diverse theologies and philosophies. Our congregation chose the path of embracing that religious diversity and opening up our services, religious education, social justice ministries in ways that broaden who belongs in our congregation to include everyone who belong in our larger faith. (Other congregations are free to make a different decision, and there is room among our congregations to have places that are more particular in their identity as Christian UUs, Humanist UUs, etc.) For us, this choice has led to significant growth, and we were awarded the O. Eugene Pickett Award for numerical and institutional growth in 2015. There are many people in Morris County searching for a religiously plural place to worship. For example, in our congregations we have families that hold multiple religious identities, such as a Humanist UU and Theist UU couple or a Hindu-UU and a Jewish-UU couple. We serve in a region of our country that is filled with multi-faith families, and we have found a value in reaching out to families that encompass diverse religious identities as well as those that simply identify as Unitarian Universalists. Here are some of the elements that have made this transition successful for us. Our Sunday Services throughout the year draw from the wisdom of many sources and include voices of people who identify with those varying sources. In order for people to feel like they belong and are part of shaping the direction of the congregation, the leadership of the services and other aspects of congregational life need to include people who reflect their cultural, racial, generational, and religious/philosophical identities. Our adult education and practice groups provide opportunities for people to go deeper with those who share a religious identity. For example, this year many Humanists participated in the hUUmanist Reading Group and the Sunday night meditation group. One of the most popular classes I have ever taught was a class looking at the history of Humanist developments within Unitarian Universalism over the last century – both Humanists and non-Humanists attended and were eager to participate. We have also found that it is important for our Committee on Ministry to have conversations with members throughout the congregation over time to find out what would enhance their experience. This is part of our process to evaluate how we are doing at meeting the needs of a theologically/philosophically diverse congregation. We also educate our members about the diversity present and why certain experiences will match their theological orientation and others won’t over time. We create a community where we strive to be grateful during the moments when someone else’s spiritual needs are being met, and they do the same for us. Many experiences are broad and inclusive, and it’s clear that the topic presented is being shared through multiple lenses. Ultimately, what I have found is that those who choose to be within the fold of Unitarian Universalism value connecting with varied beliefs and multiple sources of wisdom as a way of honing what they believe and cherish. There are many Humanists, Christians, UUs with no hyphen, etc. for whom that is the case. It is when someone prefers a more dogmatic approach and to be with co-religionists who all think like them that another, more exclusive approach may work better. There are advantages to both contexts on the religious journey. Our challenge in offering a wide tent is to be both broad enough and deep enough to be a religion that holds people over a lifetime. Question 4. What excites you about the future of humanism in America--what new projects or communities do you see succeeding in this arena? And how can Unitarian Universalism be a part of that? There is a growing energy and excitement among Humanists across the United States and internationally. Many more people are learning about and identifying with atheism, Humanist, and freethought. At the same time, Humanism has evolved in powerful ways over the decades to encompass more vibrancy and humility which has allowed Humanists to engage more fully as partners contributing to interfaith organizing and justice movements. We are much more likely to see Humanists (who are UU and not-UU) engaged and invited to join with people of many faiths in actions of public witness, solidarity and advocacy around climate justice, racial justice, and more. Unitarian Universalists often play an important role in interfaith settings to bridge across religious difference, and we can be mindful to include and to collaborate with neighboring Humanist Societies. As someone who has spent a significant part of my life leading and supporting campus ministries, I have watched closely as a growing number of colleges have hired Humanist Chaplains and host Humanist Campus Groups. Greg Epstein, of the Humanist Chaplaincy at Harvard University, is one of the best-known examples. A portion of the students active in campus groups will seek a congregation to affiliate with while in college and many more will seek a congregation or community at some point after graduation. We have an opportunity for collaboration between Unitarian Universalist Campus Ministries and Humanist Campus Groups on colleges now, and these collaborations will help us anticipate the growing needs of our membership in the future. We already have UU ministers serving Ethical Culture Societies and Ethical Culture Societies, which are a part of our larger UUA. A strong and religiously plural Unitarian Universalism will include intra-faith and interfaith collaboration with Humanists as a part of our present and future. If we look internationally, there are also some other examples of Humanist and Secular Societies that we can learn from. The Sunday Assembly is growing and thriving in England, and many new Sunday Assemblies are being planted in the US as well. This is happening at the same time and in the same locations that some U/U congregations are struggling to maintain numbers. We can look to these groups to reflect on traditions that may no longer be serving us and on innovations that would help us to better serve the segment of our population who identify as Humanist/atheist/freethinking.